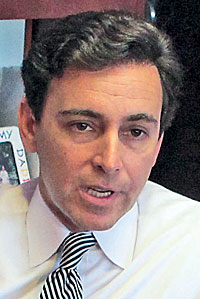 After rising quickly through Ford's executive ranks, Mark Fields has been the company's president of the Americas for seven years. DETROIT -- Mark Fields was once on the fastest of fast tracks at Ford Motor Co. He rose quickly through the executive ranks with stops at Mazda Motor Corp. in Japan and at Ford of Europe before landing at headquarters as president of the Americas in 2005. And there he still sits. In the middle of last decade, with industry sales sliding and Ford floundering, attempts by Fields and Ford Chairman Bill Ford Jr. to restructure the company weren't getting much traction. Bill Ford recruited Alan Mulally from Boeing Corp. to be CEO. Mulally engineered a turnaround for Ford and dramatic changes in its formerly faction-ridden culture. But Mulally's presence in the CEO post has stymied, at least for now, Fields' rise within Ford. Ford's board of directors hasn't set a date for Mulally's departure. Indeed, Bill Ford has indicated that Mulally can remain CEO as long as he likes. Fields, 51, has held the president of the Americas job for seven years, by far his longest stay in any job since he came to Ford in 1989 as a freshly minted Harvard M.B.A. His longest previous stint was three years in London as executive vice president in charge of Ford of Europe and Premier Automotive Group. Fields has done something his detractors weren't sure he could do: He put his CEO ambitions on hold, learned from Mulally and became a more relaxed, self-assured executive in the process. Bill Ford "was impressed with the way Mark Fields had swallowed his anger at being upstaged by Mulally, embraced [Mulally's] cultural revolution and become his keenest student. Ford was equally impressed with Fields' loyalty," wrote author Bryce Hoffman in his book American Icon, his account of how Mulally saved Ford. During a recent interview in his office at Ford's Product Development Center, Fields shook his head as though he couldn't believe how long he has held the same job in a career defined by upward mobility. Fields has had time to ponder the lessons learned by staying put for so long. He says he has gained insights over the last seven years. One of them is: "Be comfortable in my own skin." To be sure, Fields still comes off as a very slick, polished executive more at home with a PowerPoint presentation than folksy banter. But he no longer peppers his remarks with M.B.A. buzz words, one of several former habits that often seemed aimed at impressing those around him. Instead, he now exudes a confidence that comes from heading what is, by far, Ford's most profitable business unit. The most important lesson he has learned, Fields says, is a truism of the automobile business that often gets just lip service: "Product is still absolutely king. Period. Never compromise." Ford's recent success has been built on a series of fuel-efficient cars and trucks, planned when fuel economy wasn't at the top of customers' wish lists. That gives credence to Fields' statement that he has taken the importance of product to heart, especially when paired with another lesson he has absorbed by staying in one post so long. "Decisions that were made five, six or seven years ago -- you get the perspective of coming and seeing the results of that," he says. "The things that are failures or don't work out, you learn from that, and hopefully the next time you make a decision like that, you come out with a better outcome. The things that are successes, you celebrate those with the team and then move on." Fields is eager to portray himself as a team player and consensus builder. He says he has learned to be a better listener. "I subscribe to the school of asking questions and listening and not talking. That way you draw out the best of people to kind of understand their points of view," he says. "My most important role [is] really bringing out the best strengths in my management team so they can bring those strengths to bear on the business. The business can benefit from that, and they can develop as well as people and as business persons." Another lesson Fields says he has learned: to work with people who are diametrically opposite from him in temperament and personality type. Asked to give an example of such an opposite, Fields doesn't hesitate: "Jim Farley," Ford's vice president of global marketing, sales and service -- and a man also touted as a possible candidate to succeed Mulally. Some who have worked with both Fields and Farley say there has been tension between the men, both of whom spent time in the luxury car business: Fields with Jaguar, Land Rover and Volvo when Ford owned those brands, and Farley with Lexus. But Fields says they get along today. "We work very well together because, I think, we respect each other as business people but also we respect each other as individuals," he says. "Everybody's not like you or should be like you, but you've got to fit those pieces of the puzzle together." When asked how he feels about the board's decision to let Mulally stay indefinitely, Fields brushes the question aside: "Listen, I think Alan is providing great leadership for the company. My ambition is to contribute as most as I can to the profitable growth of Ford. That means continuing to lead the Americas and make our contribution to the company, and I'm very happy with that."